Whether marketing to businesses or consumers, look to Lorton Data for quality lists and help with your multi-channel marketing campaigns. You can research list options on your own with our online system A-Qua Lists or reach out for a personal consultation with one of our list experts. A-Qua Lists is Lorton Data's online list count, order and fulfillment system. To see how it works, call us at 651.203.8290 to receive a login. There's no obligation, and we are confident you will like what you see. Plus you can take advantage of discounted rates. Talk to an expert today at 651.203.8290. Millions of people observed the solar eclipse on August 21st, 2017 that passed over the U.S. To commemorate the event, the USPS released a special Forever Eclipse stamp. The thermochromic ink of the image responds to the heat from the touch of your finger. Read more about the stamp and its photographer here. As recent weather events in Texas, Puerto Rico, Florida and now California have shown, natural disasters can cause significant disruptions to the mail delivery system. The Postal Service has done an extraordinary job keeping the industry informed. Access current disruptions here. The USPS recently announced its intent to raise postage rates tentatively effective January 21, 2018. For more information, visit the PRC site at https://www.prc.gov/doc. See Docket No. R2018-1 for the Mailing Services filing, and Docket No. CP2018-8 for the Shipping Services filing. Would you like to receive service alerts from the USPS? These alerts provide real-time updates regarding mail disruptions. Go to USPS Service Alerts for more information. For a quick reference on current USPS pricing, download the Lorton Data Postage Rate Guide. 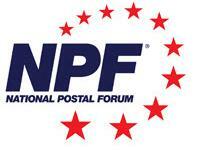 The National Postal Forum conference will be held in San Antonio, TX May 6-9th, 2018. Mark your calendars.